A fast acting spray perfect for dry itchy skin. Instantly cooling, moisturising and calming. 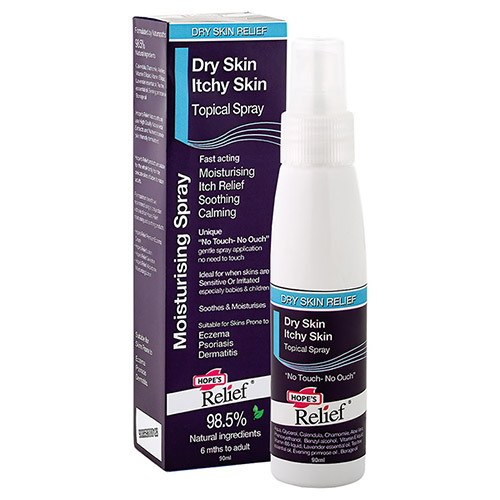 The gentle spray soothes itching due to dry skin and contains liquid moisturisers. Developed by naturopaths and free from skin irritating nasties. The gentle spray soothes itching due to dry skin and contains liquid moisturisers and the pure liquid delivery helps assist the skins own healing process. Help break the itch, scratch cycle with 10 natural actives including aloe vera, calendula, evening primrose, tea tree and borage oils. Developed by naturopaths, Hope`s Relief spray is free from irritating nasties including steroids, fragrances, SLS, parabens, paraffin, lanoline and petrochemicals. Aqua, Castor oil, Glycerol, Calendula, Chamomile, Phenoxyethanol, Benzyl alcohol, Aloe Vera, Vitamin E liquid, Vitamin B5 liquid, Lavender essential oil, Tea tree essential oil, Evening primrose oil , Borage oil. 2.Hold about 10cm’s away from the skin and spray across the skin when pressing the pump. 3.Apply 3 - 4 times a day with a light spray. 4.Can be lightly patted in to assist absorption. 5.When applying to the face or around the eyes spray onto a cotton pad and pat onto the skin. Stop using the spray if you experience any discomfort. Below are reviews of Hope`s Relief Dry Skin Relief Spray - 90ml by bodykind customers. If you have tried this product we'd love to hear what you think so please leave a review.